I suspect the bookring flood is about to begin again, after a bit of a dry spell – I’ve had several PMs over the last week asking for my address so people can send books on to me, and The Daydreams and Doodles Journal arrived today. It’s a fun idea – a book filled with almost-blank pages, which have suggestions for what you might want to draw or write on them. Everyone who receives the journal gets to pick a page to complete (or you can just add a little bit to several pages). It’s been round 17 people so far, and is filled with all sorts of fascinating stuff – including a copy of someone’s brain scan!!! Might have to dedicate some time over the weekend to having a proper look at everyone else’s entries, and try and get some inspiration for my own. Currently reading: The Trapp Family Singers by Maria von Trapp (the orginal story for The Sound of Music), and Somebodies and Nobodies: Overcoming the Abuse of Rank by Robert W. Fuller. I’ve been back from Sydney a couple of days now, but I still haven’t managed to write up my diary entries for the trip. Wanting to get them done quickly before I forget everything is battling with wanting to catch up on some sleep, and sleep keeps winning. But I’m working on it! We were running a bit late, so littlemave suggested that instead of the others waiting for us, they should set out, and we’d head them off at the pass (for once I could see the value of cellphones!). First stop (I think, see note above) was the Museum. We didn’t actually go in, but a tinymave helpfully ran in and left Keep It Simple, Stupid by Peter Goldsworthy inside the entrance for me. Then we passed the Hyde Park Barracks, where I hid A Five Year Sentence by Bernice Rubens (seemed appropriate!) in a display on the barracks wall, and Sydney Hospital, which got What Katy Did at School by Susan Coolidge (on a windowsill) and The Stray Cat by Steven Paulsen, propped against a very strange fountain/sculpture of a dribbling pig. We met the other bookcrossers outside the State Library of New South Wales, and I released Potiki by Patricia Grace. Inside the library was suitably hushed (and air-conditioned! – yet another thing I was rapidly learning to appreciate 😉 ), so we reverently looked at Tasman’s map on the floor of the foyer (releasing Planets by Denise and Grant Ford and a School Journal), and peered through the windows at all the people busy studying the books (it’s not a taking books out sort of library, it’s more like the British Library, where you just come and look at the books in situ), then headed through to another area where they had various rare books on display – a magnet for a bunch of booklovers! The way out led us past the gift shop (of course! ), so I bought myself a little Trim badge (Trim was Matthew Flinders’s cat, who sailed around the world with him – there’s a statue of Matthew Flinders outside, and an accompanying statue of Trim, who seems to have become the library’s mascot, judging from the array of Trim memorabilia available in the gift shop) – Skyring pointed out that it was meeting of FutureCat and PastCat, and insisted on taking my photo next to Trim’s statue when we went outside. I released Cats by Denise and Grant Ford on the display case of Trim memorabilia in the gift shop, and Kate’s Christmas Present by Inger & Lasse Sandberg (which is about a cat) beside the statue. Then we headed into chinatown, passing a backpackers’ with a book swap shelf visible from the window (so we all piled in to inspect the shelf and leave a few books ourselves – I left Golden Deeds by Catherine Chidgey), and the Capital Theatre, where The Lion King is being performed. I had the perfect themed release to leave outside the theatre: Fluffy the Show Cat by Denise and Grant Ford (it even has a lion-like picture of a fluffy ginger cat on the cover complete with mane framing its face). Next stop was for ice-cream, at a place that specialised in exotic flavours (I chose green tea – it was surprisingly good!) and had a strange policy – if you wanted to sit down at a table to eat your icecream, then it cost twice what it did if you just stood and ate! Naturally, we all chose to stand! But I still left a book: Whales by Denise and Grant Ford. By this time, the tinymaves were getting tired, so littlemave decided to take them home. The others were heading off to hit a few bookshops, but as I was flagging myself by this time, I decided not to join them, but headed back with littlemave & co. instead. Of course, we did a bit more bookcrossing on the way – releasing Inquisition by Anselm Audley next to a statue of a bull (a very weak themed release: bull – bullfighting – Spain – Spanish Inquisition), and a couple more books in the park: Where’s Waari ed. by Witi Ihimaera and Jennie’s Hat by Ezra Jack Keats. Back at littlemave’s apartment, I managed to wrest control of the computer from the tiniestmave just long enough to check that none of my releases had been caught, and then settled down with the other two tinymaves to watch a video and try and recover a bit of energy before we had to head out again for the quiz night. After finally gaining entrance to the apartment, we set out with Littlemave and the Tinymaves for the first conference session of the day – a flashmob at the Opera House. We were running late, so caught a train down to the harbour (and I released The Secret Hide-Out by John Peterson on the platform), and met the other Bookcrossers at a Starbucks in Circular Quay (where I discovered the amazing cooling properties of a strawberry “frapaccino”). Once we were all gathered and suitably refreshed, we were given our instructions for the flashmob. First step was to disperse, so that we didn’t all approach the Opera House in one big group – the key to a successful flashmob is for it to appear spontaneous. By the time I joined the line, it was getting long enough to start attracting attention from passing tourists, and one man even started taking photos of us (we were imagining the conversation when he got home and showed his holiday photos to his friends: “And this is Sydney, where people sit in lines…”). Once everyone was in the line, fushmush started passing the books she’d been given back down the line, one at a time. As each book reached the end of the line, the person at the end would put down the book where they’d been sitting, and then walk off, so that a line of books was left behind on the steps. Meanwhile, the books were attracting quite a lot of attention, and we watched with glee as people stopped to look at the books (which by now were fluttering dramatically in the strong wind that had suddenly come up). It was great fun watching people’s reactions as they read the “free book” notes on the front of the books – some quickly grabbed up several books, others sat down to read one on the spot, and others were more furtive, checking to see who was watching before they snatched one up. Eventually, we left the books to their fate, and a group of us adjourned to a nearby hotel for lunch. So, Mr Grumpy Man, your picture is now on the internet as a warning to all Bookcrossers not to release books near you! After lunch, it was back to Littlemave’s apartment, to drop off one of the Tinymaves, who was getting sick of bookcrossing, and to pick up a new supply of books for release, and then we were back out for the next event, the release frenzy. What’s the number one thing you should do when entering a new time zone? Yep, change your watch. And what did I forget to do on Friday night? That’s right, change my watch. So my alarm happily went off at 7 am NZ time – which is 5 am Sydney time And of course, once it had woken me up, my body clock, not as easy to change as a watch, said “it’s time to get up!”, and I was wide awake. It was getting light outside, so I decided to sneak out onto the balcony (well, I tried, but you just can’t sneak out of a top bunk, so I’m afraid I woke Lytteltonwitch up anyway – sorry!) to see if the view was as good as I remembered it. (The neon sign in the second photo is Kings Cross). Now that we were both wide awake, we of course wanted to get out and start exploring the city (and releasing books! ), so we thought we’d leave Littlemave and her family to sleep, and sneak out to find breakfast at a cafe somewhere. First stop was the park, to release a few books: According to Jennings on a monument (where I had my first encounter with a (tiny) Australian spider – Lytteltonwitch released a book there too, and when we walked past later, mine was gone, but hers was still there, so we decided the spider must have eaten mine), and Anne of Green Gables on a statue of Captain Cook (probably should have left a NZ book there, I suppose!). After breakfast, we decided to try and find an internet cafe (to make release notes on the books we’d released so far), and walked back the way we’d come in the taxi the night before. Of course, we couldn’t find one anywhere (Littlemave later told us if we’d only walked in the other direction, we would have found several within a couple of hundred metres! ), but we released a few more books on our wanders: Only an Orphan on the steps of the Catholic Cathedral (seemed like an appropriate themed release – and so far is the only wild release in Sydney that I’ve had caught! ), The Fire Raiser on a statue of Queen Victoria, and Women, Politics and Power in another part of the park as we walked back to Littlemave’s apartment (it occured to me later that I should have left that book on Victoria’s statue!). When we got back to the apartment building, we realised that we couldn’t get in – the night before, Littlemave had used a swipe card to get into the building, and to use the lift. There was an entry phone, but had either of us thought to take a note of the apartment number? No, of course not – all we knew was that it was on the 13th floor – we didn’t even remember Littlemave’s surname! We managed to get into the foyer, by dashing in when someone opened the door to come out, but the lift refused to go anywhere without a swipe card. Another resident came in a few minutes later, and we asked her if she’d let us up to the 13th floor, but she said each person’s card would only let them take the lift to their own floor. So it looked like we were stuck. We were just about to resort to pressing every 13th floor button and hoping we didn’t annoy too many of Littlemave’s neighbours before we found the right one, when the concierge arrived. “This is going to sound really stupid,” I said, “but we’re staying with some people on the 13th floor, and we don’t know their apartment number, or their surname. Their names are ***** and *****, and they’ve got three little kids…” Luckily, he didn’t throw us out on the street, recognised the Littlemaves from my description, and gave us the apartment number so we could use the entry phone. I wrote the number down, just in case. The taxi dropped us off a few doors away from the pub, and Hawkette and I struggled to carry our own heavy bags, plus Lytteltonwitch’s bag of books (Lytteltonwitch was under strict instructions from her doctor not to carry any heavy bags this weekend, so I’d promised to play pack horse for her), plus the two bags of duty free… we made it to the pub door, only to be confronted with a flight of steps. I lugged my share of the bags half way up them, and asked the bouncer standing at the top where we could find the Bookcrossers. He indicated another flight of steps, and said “Up there, round the corner, then up to the third floor”. Our hearts sank. I volunteered to go and get help, and thus it was that the Sydney Bookcrossers’ first introduction to FutureCat was of a red-faced sweating woman laden down with duty free, who gasped out “I need someone strong, Lytteltonwitch and Hawkette are stuck at the bottom of the stairs with the rest of the bags”, and then collapsed into the nearest chair. Luckily, the wonderful Skyring and k-j-h sprang to our rescue, and raced downstairs to help the damsels in distress. Once I’d recovered enough to look around me, all I could see were books and Bookcrossers – three tables laden with books and surrounded by eager Bookcrossers, plus others standing around talking and drinking. It would have been Bookcrossing heaven if it wasn’t for the noise – maybe having the registration event in a pub on a Friday night wasn’t such a good idea, because the music was up so loud that conversation was difficult, which was a pity, because the one thing that all these bookcrossers (most meeting for the first time) wanted to do was talk! I contributed a few books to the tables myself (I just opened my bag and pulled out the first few that came to hand). Some were pounced on by other Bookcrossers, and the rest were collected up at the end of the evening and re-released later. There were also a few books I’d brought over especially for particular Bookcrossers. And, of course, the infamous cheat book. This book started off at a meetup where we happened to have internet access, and as a joke, everyone at the meetup caught and released it. Then it did the rounds again at the Christchurch mini-convention earlier this year, where the official “rules” for cheating were established (to make a journal entry on the book, you must have held it in your hand (photographic proof preferred), and you must not, under any circumstances, actually read it!). So it was a natural choice to take to the BC-AUS convention, where it was much appreciated: all weekend we saw it being passed around and photographed with various Bookcrossers. Goody-bags were distributed – not only was it filled with bookmarks, labels, stickers, sheets for recording released books, and other useful things, but the bag itself was a nice cotton bag (ideal for carrying books!) emblazoned with the “Bookeroo” convention logo! Eventually, as the night wore on, the music got louder and the lights got dimmer, so someone suggested we move on to a cafe where we could actually talk (clever person, whoever it was!). About a dozen of us went to a cafe in the QVB (Queen Victoria Building), and sat around chatting in more convivial surroundings than the noisy pub. Before we left (at nearly midnight – Lytteltonwitch and I were seriously feeling the 2-hour time difference! ), Littlemave suggested that we place a few books around the base of the giant Christmas tree inside the building. There was a scarey security guard standing beside it though, so we just released the books on nearby benches instead. We were going to walk back to Littlemave’s apartment, but even with her helping, the bags were too heavy to carry very far, so we got a taxi instead. I knew she’d said her apartment was pretty central, but I was surprised when the taxi pulled up in a side street right beside Hyde Park! And then even more surprised when we saw what an impressive looking building it was – this was no inner-city tenement! But (as Douglas Adams might have said) my surprise then turned to astonishment when I discovered that not only was the apartment on the top floor (penthouse!!! ), but it had the most incredible view out across the city to the harbour! But even a stunning view wasn’t enough to keep me awake by that time, and I very gratefully sunk into my top bunk (kindly given up by one of the Tinymaves, who were camping out in the lounge), and was quickly asleep. 1:00 pm, NZ Time: Lytteltonwitch and her son picked me up to go to the airport. We got there nice and early for check-in, so were able to get good seats, and also ask the person at the check-in desk whether the books would cause a problem with security (we’d heard that books can look suspicious on the x-ray machines), but she didn’t think it would be a problem. So, with 2 hours to wait, we went off to find an internet kiosk to let the Australians know we were on our way. It turns out there is only one internet kiosk (when I say “kiosk”, I mean “very old looking computer on a small desk hidden in an obscure corner”) in the whole of the international departures lounge of Christchurch airport – or at least, if there’s another one, we couldn’t find it! It was coin-operated, so Lytteltonwitch put in $2, and clicked on the button that looked like it should take us to the internet. Instead, it took us to some sort of registration page, and wouldn’t let us out again. There were no browser controls that we could see, so we tried registering with some fake details, which it seemed to accept… and took us back to the page with the internet button. After a few more loops between these two pages, we gave up in disgust, and decided the machine was just a scam to get an extra $2 in airport tax out of travellers. With no internet to distract us, the lure of the duty free shops became very strong, but we managed to resist (well, apart from Lytteltonwitch buying a book! ), and settled down to wait for our boarding call… and wait… and wait… Finally, just when we were starting to think that maybe security had got upset about our bags and were off somewhere calling the bomb squad to unpack them, they let us board the plane. And then we waited for it to take off… and waited… and waited… eventually a voice came over the intercom: “This is flight NZ184 to Sydney. If you are not going to Sydney, please alert a member of the cabin crew.” I joked that it seemed a bit silly to need that message when we’d been through so many checkpoints already – surely it would be impossible to get on the wrong plane? However, a few minutes later, the voice was back “Sorry for the delay, but we seem to have more passengers on the plane than are on our boarding list. If you do not have a boarding pass, please raise your hand.” Of course, no hands went up, and we continued to wait, while one of the crew walked back up and down counting one more time, and the others clustered around a clipboard at the front of the plane, consulting. Eventually they must have resolved the discrepancy, because the plane did take off, without anyone being dragged kicking and screaming off it, but they never explained what had gone wrong. Gives you great confidence in an airline when they can’t even count their passengers correctly! The flight was pretty uneventful. I avoided the movie (I, Robot – I had enjoyed the book, so I was too scared to watch the movie and see how they’d destroyed a good story – I don’t remember Will Smith fighting off hordes of killer robots in the Isaac Asimov version…) and spent most of the flight reading my book (My Life As Me, the autobiography of Barry Humphries. I was hoping to finish it before the end of the weekend so that I could leave it in Sydney, but as it turned out I was kept so busy in Sydney that I didn’t have time to read, so it came back home with me.) We did manage to release a book, though – one of the cabin crew came round handing out arrival cards for Australia, and, making conversation, asked us if we were going to Sydney for the shopping. So we said “No, we’re going to leave books all over the city!”. Of course, we then had to explain the concept of Bookcrossing, and as she seemed interested, Lytteltonwitch handed her the book she’d just finished reading (Thursday’s Child by Noel Streatfeild). It’ll be interesting to see where that book pops up next! We’d flown over cloud most of the way, but just off the coast of Australia the cloud finally thinned, and we flew into a glorious day in Sydney. We had a wonderful view of the Opera House and Harbour Bridge as we flew over (and didn’t think to get my camera out, of course!). Landed safely (obviously, or I wouldn’t be writing this! ), waited again in interminable queues (picking up a few bottles of duty free for Littlemave on the way past – she’d given us a shopping list) through passport control (the customs officer wasn’t impressed that we didn’t know Littlemave’s address or phone number, but agreed to accept my email address as a contact address, providing I promised to check it regularly – apparently they have to have a way of contacting everyone in case another passenger on the plane comes down with SARS or something), customs, another security check, and finally out into the terminal, where we’d arranged to meet Hawkette. We had no idea what she looked like, but were working on the assumption that, just like at meetups, Bookcrossers usually manage to find each other. 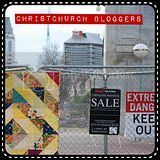 And we were right – no sooner had we stopped to look around for a likely suspect when a woman clutching a book came up to us – she’d spotted the Bookcrossing logo on Lytteltonwitch’s t-shirt! Lytteltonwitch (left) and Hawkette waiting in the taxi queue. Outside the airport, the heat hit us. I knew Sydney would be hotter than Christchurch, but I didn’t know it was going to be that hot! I commented on the heat, and Hawkette (who’s from Melbourne) said “Yes, the weather’s finally improved today”. We waited in another queue to get a taxi, and headed straight into town to the conference registration (which, of course, was at a pub the taxi driver had never heard of – luckily, Lytteltonwitch had printed off the directions and map from the conference website). The patch I’ve sewn onto my bag is from the US Bookcrossing Convention this year. I wasn’t there, but ThanksMom very kindly sent us over a pile of them as gifts for attendees at the NZ mini-convention which was held at the same time. Bookcrossers really are wonderfully generous people! Only 1 day and 18 hours to go until we leave for Sydney!!! Had a very small meetup tonight, probably because we changed the day and confused everyone. Only me, Lytteltonwitch, and Awhina, but we shared a very nice pizza, and followed by cake (Awhina was going off to meet some friends for dessert to celebrate her birthday, so deferred on the cake), and Awhina gave us a few books to take over to Sydney with us. Lytteltonwitch and I arranged the last few practical details of our trip (she’s going to get her son to give her a lift to the airport, so they’ll pick me up on the way past), so it’s now all systems go! Just to prove that you should never give up on hearing from a released book: In April, MrPloppy, ORNOT, and I spent a few days travelling around the bottom half of the South Island, stopping off at various points of interest along the way, and releasing books as we went (from memory, I think we released over 80 books). I got quite a few good catches, but most of the books disappeared without trace (as is normal). Until last night, that is, when I got a catch notice on this book, that I’d released at Larnach’s Castle, in Dunedin. Seven months and one day between release and capture! And best of all, not only has the finder joined Bookcrossing, but the book has travelled as far as Australia!